The monument is dedicated to the victims and devastation caused by the Ash Wednesday fires of 1983 and is a tribute to all who helped rehabilitate the community. The Ash Wednesday bushfires, were a series of bushfires that occurred in south-eastern Australia on 16 February 1983, which was Ash Wednesday in the Christian calendar. Within twelve hours, more than 180 fires fanned by winds of up to 110 kilometres per hour caused widespread destruction across the states of Victoria and South Australia. Years of severe drought and extreme weather combined to create one of Australia's worst fire days in a century. The fires became the deadliest bushfire in Australian history, until the Black Saturday bushfires in 2009. 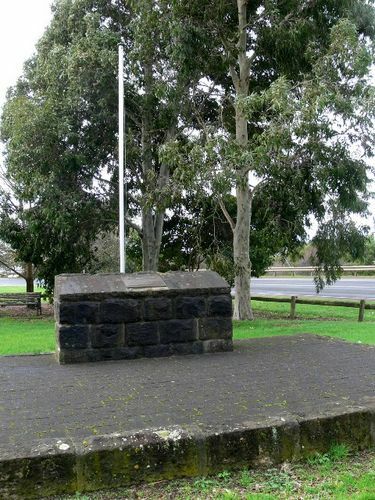 The plaque was erected by the Warrnambool Shire Council in conjunction with the Victorian Farmers Federation as a tribute to the selfless contribution by the nation’s farmers, service clubs, and other volunteers in rehabilitating this community in a period of great need after the Ash Wednesday fire disaster. The disaster, on 10th February 1983, resulted in the loss of nine human lives, burnt 60, 000 hectares within the shires of Warrnambool, Mortlake, Heytesbury and Hampden, affected 500 properties, destroyed 157 houses and also killed 13,500 cattle and 15,000 sheep and destroyed 7,700 km of fencing plus public buildings and facilities. The response from the region, elsewhere in Victoria and interstate was magnificent with countless hours given by voluntary organizations and primary producer groups with donations of 1600 dairy cattle and over 200,000 bales of fodder. The disaster resulted in co-operation between municipalities, government agencies and volunteers on an unprecedented scale in the interests of the victims of the fire.